Niall and Abbi's humanist wedding took place in the forest at Hockering House, Norwich. I fell in love with Abbi and Niall when they suggested we hold their wedding ceremony planning meeting on a houseboat in Chelsea, belonging to Niall’s incredibly glamorous aunt Cecelia, and perhaps go for a few drinks at Chelsea institution Bluebird after we were done. They clearly had me pegged as Made in Chelsea fanatic even before I’d revealed the true extent of my SW3 obsession! And when I told them I’d once appeared as an extra in the Made In Chelsea 2013 Christmas special - well, a VERY blurred shot of my chin had made an appearance - bless them, they pretended to look suitably impressed. I knew there and then we were made for each other. Niall and Abbi have a wonderful story. They first met around ten years ago through work and were immediately taken with each other. Niall thought Abbi was gorgeous and, likewise, Abbi liked the look of the ‘cute geek in the oversized suit’. However, at the time they were both in relationships with other people. And so, that was (seemingly) that. Niall moved on and the two of them lost touch. The poet Laura Hendricks describes love as “friendship caught fire” and that is such a fitting description for Abbi and Niall’s relationship. So brimming with affection and, frankly, giddiness, are the two of them, that it takes very little to push Niall and Abbi over the edge. It’s like they can’t quite believe their luck that they found each other – and, so abundant with love are they for each other that they’ve become deliciously delirious… prone to descend into fits of the giggles at a moment’s notice (and their little beaming faces are contagious are just contagious to be around!). 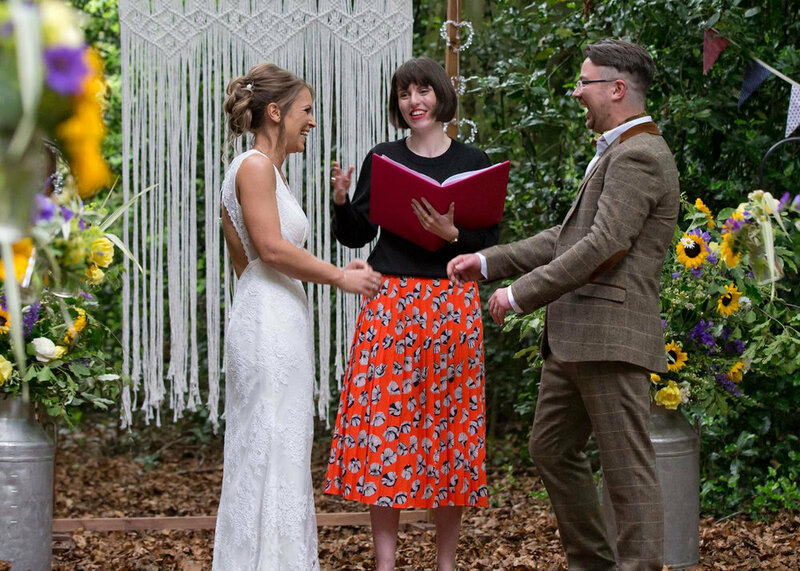 Niall and Abbi chose to include a handfasting in their humanist wedding ceremony. Equality is a theme for Abbi and Niall’s relationship and the choices they made in their humanist wedding ceremony reflected this, from their decision to walk down the aisle together, to incorporating a handfasting (a Celtic ritual which symbolizes two individuals happily marrying of their own free will, rather than feeling, in any way, bound to each other). It’s also the first time I’ve been to a wedding where the groom has chosen a cool gang of BEST WOMEN, rather than a best man and ushers (extra feminist brownie points Niall!). Abbi and Niall’s humanist wedding ceremony took place in the woods at Hockering House, in Norfolk. The ceremony space looked absolutely magical with hay bale seating, fairy lights draped across the trees and absolutely incredible floral displays by Constance Rose. As I parted ways with Niall and Abbi, leaving them to enjoy their special day with their family and friends, I confessed to them ‘I MISS YOU ALREADY!! !’ (it’s okay I think they are onboard with the over-exuberance by now). It’s totally the truth, I’ve had a ball working with the pair of them and it was such a privilege to play a part in their wedding! CONGRATULATIONS ABBI AND NIALL! DON’T BE STRANGERS!